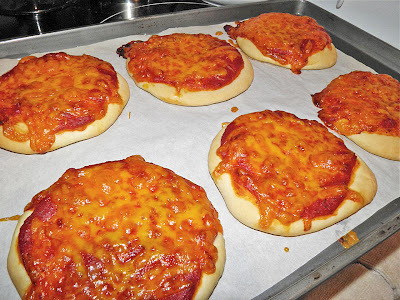 Devoid Of Culture And Indifferent To The Arts: Pizza Buns! My guiltiest pleasure. These are the "gourmet" version. Pizza buns...Ha! I hope this post isn’t useless knowledge. At least it’s not for me and I hope you find it the same. I have more than one “guilty pleasure” for sure, but this one just may be the ultimate. When I worked in Halifax I used to go to the Atlantic Superstore daily. I would pick up whatever I needed for dinner and then look for something for lunch. I’m not a big lunchtime eater. It usually was one of two things: either a dehydrated kimchi soup bowl (extremely unhealthy) or pizza buns from the store bakery. Regardless, now that I’m in the country and can’t make it to the store on a daily basis I have to take matters into my own hands. That means making dehydrated kimchi bowls at home (not really!). 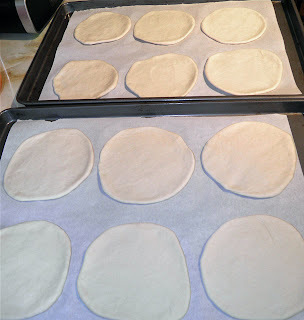 It’s time to make pizza buns! Left to right: always make sure your yeast is active; before rising, after rising. A recipe of these little darlings should last a single person a work week. Making your own bread is cheap. And since I am using up the bottom part of a jar of pasta sauce (which usually goes bad before being used) I’m saving money hand over fist. 12 at the store are around $20! I’m of two minds about making them exactly as at the store at home. My inclination is to add additional things to them, like basil, oregano and even maybe some chopped sausage of some kind. But that wouldn’t make them "real" pizza buns, now would it? In the end I opted to do half of the regular and the other half with mozzarella, pepper, basil and oregano. I had those ingredients on hand, so I thought a side-by-side comparison couldn’t hurt. These buns are a very reasonable facsimile. I don’t know how they make them in-store, but I think these tasted better. A little more homemade. Maybe it was the hopeful anticipation that I felt making them that permeated the crust! I usually have leftover pasta sauce in a jar whenever I open a new one, so this recipe will go into rotation. These have to be healthier than the grilled cheese sandwiches that I seem to be gravitating towards lately. If I keep that up I’ll be as big as a house. We’ll see. That may be another guilty pleasure post. Proof the yeast in the warm water mixed with the sugar. Once the yeast has activated, add the olive oil and flour. Mix together in the bowl and transfer to a board and knead for about 4-5 minutes. Coat the mixing bowl with a little oil and let the dough rise until doubled, about 1 hour (?). Take the dough from the bowl and divide in two. Then divide into thirds (for six pieces) and finally cut each piece in half. You will have 12 pieces of dough. 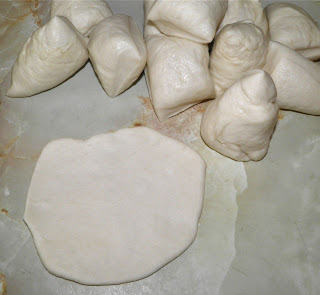 Roll or pat out each piece of dough into a round about 1/4” thick. Arrange the dough on the parchment-lined sheets and let sit for 1 hour minutes. Dimple the rounds down in the centre with your fingers. Then divide the pizza sauce and cheese between the 12. Add any additional toppings you may like. Bake for 18-25 minutes (18 for soft, 23-35 for crispy). If baking both sheets at the same time, rotate the top baking sheet to the lower rack (and bottom to the top) at 10 minutes, to ensure even baking. 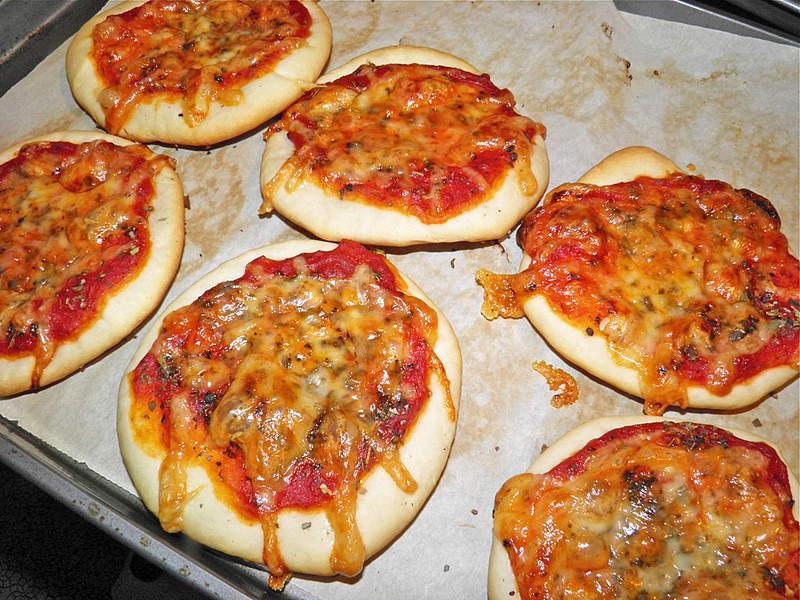 These pizza buns can be frozen and thawed later, if you don’t think you can eat 12 in short order. I bet you can! We did. These are the "regular" ones. Frighteningly close to the store.